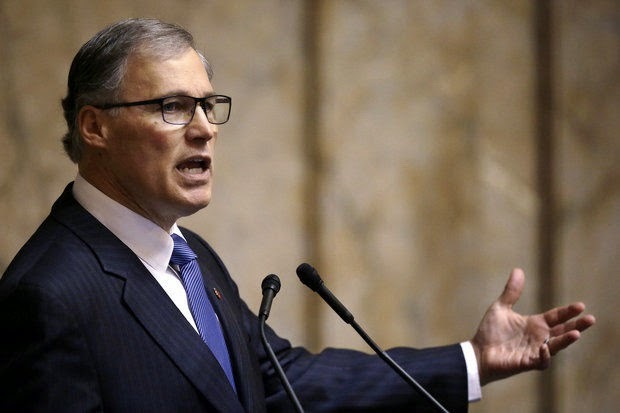 Cliff Mass Weather and Climate Blog: What Should Governor Inslee Do About Climate Change? What Should Governor Inslee Do About Climate Change? The press is full of coverage of Governor Inslee's proposed climate plan, revealing vast differences in the viewpoints of Democrats and Republicans, particularly about the controversial cap and trade program. In this blog I will suggest an alternative plan, that might be acceptable to both sides of the aisle. Maybe. Our governor really cares about climate change....and he should. Mankind is emitting huge amounts of carbon dioxide into the atmosphere and there surely will be serious climate impacts later in this century. A few years ago as a Congressman, Jay Inslee visited the UW and several of us briefed him about some of the latest research findings. I was impressed with his interest and passion in the subject...not your average politician. How many politicians have written books on the climate issue, like Inslee's Apollo's Fire? You got to respect his willingness to get in front of a major societal issue. Recently, Governor Inslee announced a climate action strategy, centered around a one-billion dollar cap and trade plan. And he has made several executive decisions to support clean energy. But I am worried about whether his approach will be effective. Recent changes in the makeup of the Washington State legislature have reduced the chances that any cap and trade plan will be enacted--and the success of cap and trade in other venues has not been impressive. So if I was Governor, what would be MY program? I. Secure a better understanding of how our climate has changed during the past century and how it will change during the next 100 years. If our state is going to deal with climate change, we must understand what has happened and what will happen. You can't make robust policies without solid information, right? As a weather/climate scientist let me assure you there are major weaknesses in our knowledge on both counts--but with some effort we can fix the deficiencies. Step 1: Strengthen the Office of the Washington State Climatologist (OWSC). OWSC has the responsibility to collect climate data for the State and to make it available to WA citizens and decision makers. To provide a clear picture of previous changes in our state's climate. This office is woefully underfunded (with a budget about 60K). There is so much that they could and SHOULD be doing, but there is no funding. The Governor and Legislature need to fix this. Soon. Step 2: Begin an active program of regional climate simulation to get a far better understanding of the future regional implications of climate change. To deal with Northwest climate change, it is essential to have reliable guidance on what will happen during the next century. The guidance used today can be dramatically improved. Global climate models do not produce consistent results about the regional implications of increasing greenhouse gases, and most of these models are far too coarse to consider the critically important terrain of the region. To plan for the future, our state needs much better information, and there is a way to get it: high-resolution regional climate models. Secure a large number of global climate models and strain out the models that fail to get the current climate right. Then run a high resolution regional climate model for each global simulation to get the local implications (see sample below), and apply sophisticated statistical post-processing to provide calibrated regional climate predictions. A regional climate prediction effort should be established immediately, with support from the State and others. In fact, a group of us have developed a plan to do so, found here. Hopefully, we will be able to find some support for the effort. The technology to secure far better future climate information is available and Governor Inslee should make regional climate prediction a top priority. This could be highly bipartisan and would supply regional planners with the information they need for resilience and adaptation planning. II. Make our region more resilient to current conditions and future climate change. Step 3: Begin adaptation planning and infrastructure improvements. Too many environmental activists look at adaptation as a dirty word, as if getting ready for future changes will lessen enthusiasm for mitigation (reducing emission of greenhouse gases). But the truth is that our society is not sufficient resilient to the CURRENT climate (e.g., the Oso landslide) and climate change will bring new stressors. Substantial global warming is going to happen--we are simply not doing enough to stop it. Therefore, the State and our Governor needs to make resilience and adaptation a priority--one that will pay great dividends no matter what happens. What could be part of the Governor's resilience plan? a. 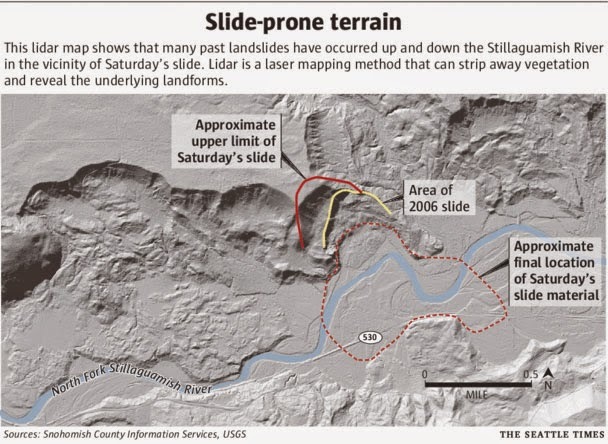 Complete a lidar survey of the state to find all historical landslide locations. Heavy precipitation is clearly going to increase under global warming and thus flooding and landslides will too. Using the best advice of geomorphologists, our State must establish restrictions on new construction in vulnerable areas and begin the process of moving people from dangerous locations. b. Evaluate whether new reservoir capacity is needed in eastern Washington. Even today, there are years in which water for agriculture/fish is a problem; what about 30-100 years from now? There is already some discussion of expanding current reservoirs and/or adding new facilities. A detailed examination of this issue, informed by the regional climate simulations noted above, is needed. Beyond adaptation, should reservoir capacity be increased to allow a massive enhancement in eastern Washington agriculture to make up for the agricultural loses in increasingly drought-stricken California? Folks need to eat. Perhaps a huge opportunity for WA State agriculture. c. Considering the potential for increased river flooding, we must evaluate current development near rivers and begin the process of moving people away from vulnerable areas. This may involve a buy-out program of some homes and businesses. It also may include improved dikes and water works. d. Evaluate ways to lessen the impacts of sea level rise along the coast and near inland waterways. Everything mentioned above is relatively uncontroversial. Now lets consider other parts of my climate plan. III. Deal with the regional transportation grid lock. 1. As traffic has increased, King County Metro CUT bus service, with long wait and inadequate service on important commuter routes. 2. Rail service north and south (Sounder trains) is not only infrequent but is often stopped, for days and weeks, by mudslides on the tracks south of Everett. Here we have a nation that could put a man on the moon, but we can't seem to stabilize a few miles of slopes above the tracks. Sad. 3. The city of Seattle has let crucial bicycle routes deteriorate (e.g., the Burke Gilman trail) and has failed to establish a safe north-south route into the city. Instead they are putting millions in a bicycle rental system (Pronto) that is barely used and has painted bicycle symbols on streets (sharrows). 4. A wonderful north-south rail corridor on the east side (where 405 traffic is at a standstill all the time) is GIVEN UP for a recreational trail. Imagine if fast commuter rail went in instead. How in the world did this happen. 5. Seattle light rail south of Seattle does not have its own right of way and is amazingly slow as it gets stuck in lights or gets into accidents with motor vehicles. More buses and frequent service especially for important commuter runs. End the slide mess and add more Sounder trains. Use Uber/Lyft/taxis for less traveled bus routes to reduce use of expensive large buses. Expand light rail around Seattle, particularly by adding a line down I5 to the airport. Add rail service to Stevens Pass skiing. IV. Do what it takes to stop the coal trains, and particularly the proposed Cherry Point and Longview terminals. Several groups have proposed the shipment of vast quantities of coal through new local ports. Such huge coal shipments, burned in eastern Asia, would be major contributors to global warming. They are also environmental and financial disasters for our region, tying up local traffic, which undermines local economic activity and produces polluting (and fuel consuming) tie ups. And on top of it, the air pollution from Asia wafts back to us across the Pacific. How many ways can you say disaster? The Governor, local governments, and WA citizens need to use all the tools at their disposal to stop the building of huge coal shipment terminals. 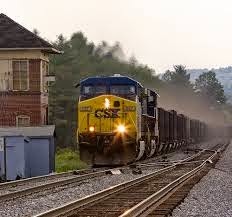 The impacts of exporting coal using these trains is so large, that everything else we do to reduce our carbon footprint is in the noise level in comparison. Put in the coal terminals and export ten of millions of tons of coal to China, and forget about your electric or hybrid car...it would be meaningless in comparison. Oil train volume needs to be reduced as well, perhaps just enough to supply oil to our local refineries, removing the need for ships bringing oil into the Strait.. Even better, oil pipelines should be used instead of rail cars. Cap and Trade, with a declining limit placed on carbon emissions and groups having to purchase emission rights, has proven to be a failure for reducing CO2 emissions, pretty much everywhere it has been tried. The most spectacular failure has been in Europe (see NY Times article here). Most environmental economists I have talked to believe a carbon tax (where a tax is placed on fuels) is much more straightforward and effective. And a carbon tax has worked effectively in our northern neighbor, British Columbia. Increasing the price of carbon is important now since the plummeting decrease in oil and gas prices is undermining the transition to fuel-efficient cars and renewable energy. And with oil/gas prices declining quickly, most people would hardly notice a carbon tax. The carbon tax would be high enough to help decrease demand for carbon fuels, but not high enough to hurt the economy. British Columbia has shown this is possible. The proceeds from a carbon tax could be used in a two ways. One, would make it revenue neutral by allowing some other taxes (like the regressive sales) tax to be reduced. Or some of the money could be used to improve the state's transportation system or deal with adaptation needs, something that would benefit to consumers and businesses alike. Anyway, the above would be some of my policies as Governor and since it is doubtful I will ever fill that role, perhaps Governor Inslee might consider a few. Adaptation is going to be necessary, as you point out, Dr. Mass. When I worked in the UW Emergency Management office, I drafted the Seattle campus' first "Hazardous Weather Operations Plan" that was rooted in what was considered climatologically-normal for Seattle. Key in planning for how to keep the university operating as a business, academic, and research hub was taking advantage of the world-class environmental research available, especially since much of it focuses on Puget Sound and the Pacific Northwest. That is why I made sure to have the final draft of the plan reviewed by staff from OWSC, and one of the criteria that triggers a review and potential update to the plan is any research produced by UW that provides evidence of a change to Seattle's climate specifically. Keep advocating for more discussion and planning at the state level; the university is already taking actions to become more resilient as the climate shifts this century! All ideas worth implementing. Should be done on a national scale as well. I was under the impression that cap-and-trade worked well for reducing power-plant emissions that cause acid rain. I assume when you say it hasn't worked, you mean when it is applied to CO2 emissions. From what I understand the acid rain problem was fixed because there never was a problem, just a misunderstanding of forest ecology. In other words, the problem was fixed by pausing to think and throughly investigate the problem. Unknown - In the case of WA State, very little of our power comes from Coal (which to my understanding is the main source of aforementioned Acid Rain?). For us, it seems as though reducing Acid Rain is not an issue - it's reducing CO2 emissions that we need to be concerned about, something that Cap & Trade is not super effective at. Cliff - Awesome work. I think most of these ideas are fantastic, and hope we can get past the political posturing and BS to actually accomplish any of it. we can't do it by ourselves. Yes, we can try, yes we can do a little better... the real change will come if sights are set on convincing China and india to get in on the game too. Why don't you just run for office Clif? Props for suggesting a statewide LiDAR survey! "Instead [the city of Seattle] are putting millions in a bicycle rental system (Pronto) that is barely used..."
Rail service to Stevens Pass skiing? You mean after all the work we put into the Iron Goat trail they should reinstall RR on old switchbacks? But seriously, why would this be even in the top 1000 of priorities? Cliff should well know about the excellent information produced by UW through the Climate Impacts Group (CIG) which HAS and CONTINUES to produce high-quality, BCSD data (to 1km grid I think) on future climate impacts. It is misleading to tell people that this has never been done. And to suggest to people that CC impacts will not be severe until 'later this century' completely misses the boat. Not only does this contradict his earlier assertion that we don't have enough information about what will happen yet, it also implies that the switch will flip from good to bad one day. The reality is that CC is here now and we will continue to see more frequent and gradually worsening effects from it. The dialogue about what to do is a worthy one, but please do not leave people with the belief that there isn't enough good science available to begin making decisions today, absent absolute information. I respect your passion about climate change, but many of your assertions are not correct. BCSD has not been done for 1-km over the region and in any case it is a statistical approach, not the superior dynamical downscaling approach that is being proposed. The folks in the Climate Impact Group are important contributors and participants of the proposed effort. And you are wrong about climate change in our area...he impacts have been minor so far, something that is easily shown by looking at observational data. But that will change later in the century. There is no switch as you are suggesting...change will be gradual, but with more rapid changes later in the century. "minor issues .... like ocean acidification" - come on Cliff, ocean acidification walks hand-in-hand with climate change and is anything but "minor"! Cliff, I appreciate your insight wrt statistical vs dynamical modeling techniques. While you are right that the dynamical WRF grids have only been done to 12km spatial resolution, my point was more that the existing BCSD CMIP5 regional models have been further applied to other datasets (e.g., hydrology) at much finer spatial scales, even <1km (e.g., http://www.fs.fed.us/rm/boise/AWAE/projects/NorWeST.html). These illustrate a more spatially complex picture of past and near-term negative effects, some of which are arguably beyond "minor." I'm sure we would both agree that "minor" is certainly a subjective term and should thus be used carefully, even in a blog. "Minor" to those on the west-side may have been a pleasant change to longer, drier summers (like 2012), but here on the east-side the data and the mood seem a little more glum, at least to those of us paying attention. A number of small business owners I know (guides, ski industry-related) would probably argue that the highly erratic winters we've experienced in the last decade have become more than a "minor" nuisance. To these folks, they are losing revenue now and continue to struggle through yet another year of low snow. The 300+ folks who lost homes in the Carlton Complex fire last summer (the largest ever in the State), or those affected by central WA fires in 2013 or 2012 would probably also disagree with use of the term "minor" as they are already experiencing extreme weather more frequently. Watching the massive explosion of dead trees killed by the mountain pine beetle in the Teanaway watershed over the last 10 years has also been alarming. And dramatically rising stream temperatures in the Entiat River (3deg C in the last 50 years!) have pushed available spawning habitat for Threatened fish to the brink of extirpation. So for what it's worth, my contention lies in your perception of the degree to which things have/are changing, not that the pain won't be even more acute in the near future. Thank you for weighing in on what is needed to address climate change here in Washington - something we all need to do and can do by just showing up. There are so many events coming up this year there is no excuse to not do something. The more people that come hearings, meetings and marches, the greater pressure there will be for broad policy action. CascadiaClimateAction.org maintains a comprehensive calendar maintained of all climate events. No reason not to do something as a citizen to show you what climate action! Thank you for bringing up the carbon tax. This is such an elegant and simple solution. I know it's evil since Al Gore talked about it 25 years ago, but imagine where we'd be now if we'd implemented it then. Or Ross Perot's fifty cent gas tax. Oops. Good ideas in general. A carbon tax as you suggested could work more efficiently than the current gas tax. As for light rail, once the planned stretch is built, that should be enough, until population density begins to approach Manhattan or San Francisco, which may be 100 years away. Why ? O & M costs for light rail are quite high and if we build any more beyond, this area will be jeopardizing the existing roads and esp. bridges (infrastructure). The reality is that there is not enough money to go around to maintain our infrastructure. Jay Inslee has been very good on this issue and should be recognized for it as you have. I agree that a tax would be a better approach and you provide a partial list as to what that tax could fund. It is important to think about what should be funded by a carbon tax. That said, What should the tax rate be? No need to answer that; it is complicated but some of your ideas and perhaps most should be included for funding. One further note, the proposed state budget by the governor includes a robust slope stability budget which includes a LiDAR component. "A wonderful north-south rail corridor on the east side (where 405 traffic is at a standstill all the time) is GIVEN UP for a recreational trail. Imagine if fast commuter rail went in instead. How in the world did this happen." Exactly the same way your (and my) beloved Burke-Gilman did. Would you rather that 'critical bike route' revert to what it once was, a commuter train from Downtown-Interbay-Fremont-UW-Lake Forest Park etc? The Eastside Rail Corridor is a terrible place for commuter trains. Aside from serving Downtown Renton and Boeing reasonably well, it goes nowhere you'd want a train to go. It traverses a narrow and single-track area in Kennydale and Newcastle surrounded by million dollar homes that would never let it expand, it misses Downtown Bellevue by nearly a mile, and it misses Downtown Kirkland. Its far better use is as a multiuse trail, and we should spend the real money to bring trains where they need to go via East Link. In 2023 we'll have 55mph rail service between Lynnwood-Downtown-Mercer Island-South Bellevue-Bellevue-Overlake. We'll serve Downtown Bellevue directly, the Spring District directly, and the Microsoft campus directly. That's a much better plan. Reasonable the Governor and leaders on both sides agree to work on Adaptation. Suggestions to increase reservoir storage for Yakima agriculture include raising the height of the Bumping Lake dam, or building a higher one downstream, to retain more water as precipitation changes from snow melt to winter rain. However, total precipitation measured at Stampede Pass has been declining since 1972 making increased capacity useless in the future. Sea Fog and Lowered "King Tides"
Will Weather Help the Seahawks? Will Snow Return to the Pacific Northwest? It's Raining, But the Radar is Clear. Why?